Any bartender will tell you that pouring a great beer goes well beyond simply opening and closing the tap, but this Micro Matic CMB-X2CH creamer faucet is sure to help both novice and experienced barkeeps achieve the perfect pour they're looking for! Simply pull the handle forward for a normal pour and then push back to finish with a rich, creamy head. 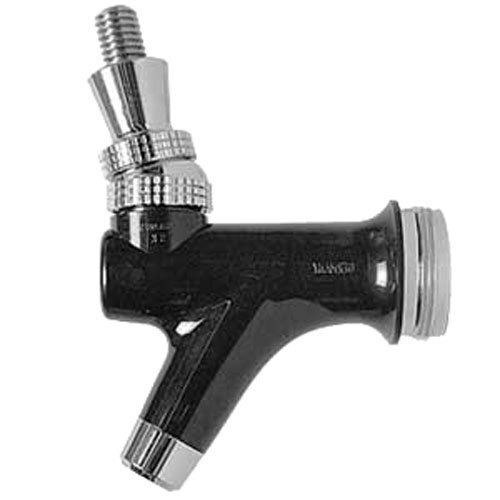 Whether you're offering patrons nationally-recognized brews, local microbrews, or anything in between, this black plastic faucet with an attractive chrome trim is sure to give you a steady, consistent pour. It has a rugged stainless steel lever that makes it ideal for larger, heavier faucet handles, while the 1-1/8"-18 body thread matches the United States beer industry standard so that this faucet could even be easily used to dispense wine or cider. This spigot also comes with a plastic spring-loaded shaft, as well as a chrome-plated brass bonnet and collar.